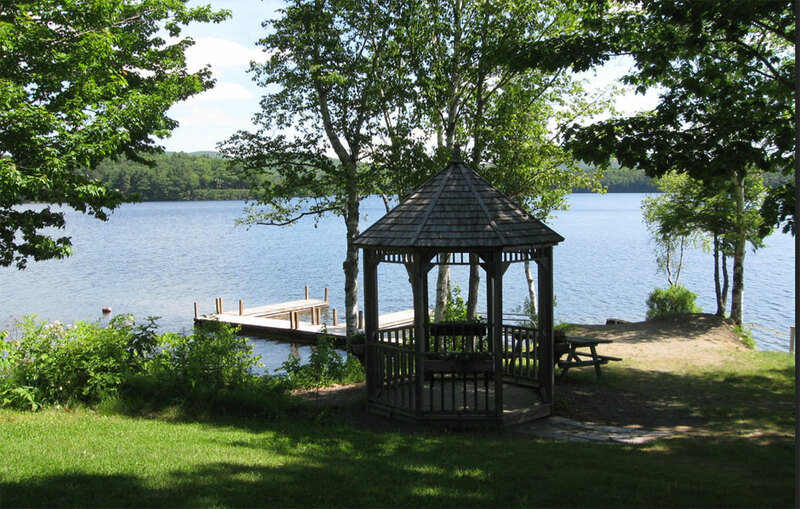 Surrounded by old growth pines and hemlocks and set atop a grassy slope leading down to our gazebo on the very edge of beautiful Alford Lake, our historic lodge offers an ideal setting for get-togethers, family reunions, weddings and dances. There's plenty of room on our expansive deck for those who want to enjoy the fresh breezes. And inside you'll find the wide open meeting room with a stage at one end, huge stone fireplace, and the well-appointed kitchen. The theme is rustic–but not completely (the bathrooms and changing area are all new this year and beautifully done). Our lodge can accommodate functions of up to 150 people. 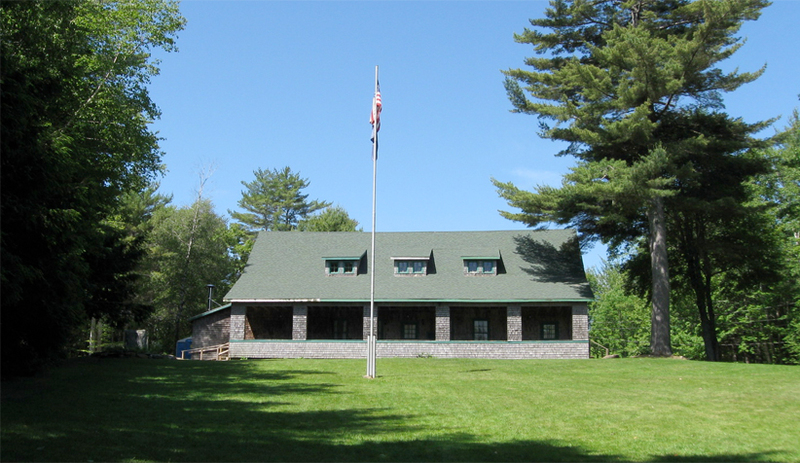 Lodge rental includes use of the kitchen, tables and chairs, and use of the grounds. (See particulars below). We charge a daily fee of $250 to rent the lodge any weekday Monday through Thursday. Weekend rental fees for Friday, Saturday and/or Sunday are $700 per day. All lodge rental commitments require a $100 security deposit. Beginning in 2018 the Lodge rental rate for Friday, Saturday, and Sunday will be $800/day. The weekday rate will remain $250/day, and the security deposit will be $100. For more information about lodge rentals, rates and availability contact Judy Labonte. 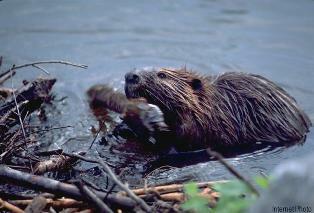 Looking for actual beavers? Go to the south end of the lake and beyond the dam you will find a beaver lodge and evidence of dam building in the quiet water between Alford Lake and Lermond Pond. 1. When arriving, immediately contact our caretakers. They will be able to answer any questions you may have and will show you around the Lodge. During your rental, the caretaker is in charge of the Lodge area. 2. The Lodge has tables and chairs for approximately 150 people. Tables and chairs may be utilized inside and/or outside the Lodge. At the end of the rental, all tables and chairs must be cleaned and put back where you found them. 3. Cooking facilities are available inside the Lodge, but you must supply your own utensils. There is a grill available–you must supply your own gas. 4. 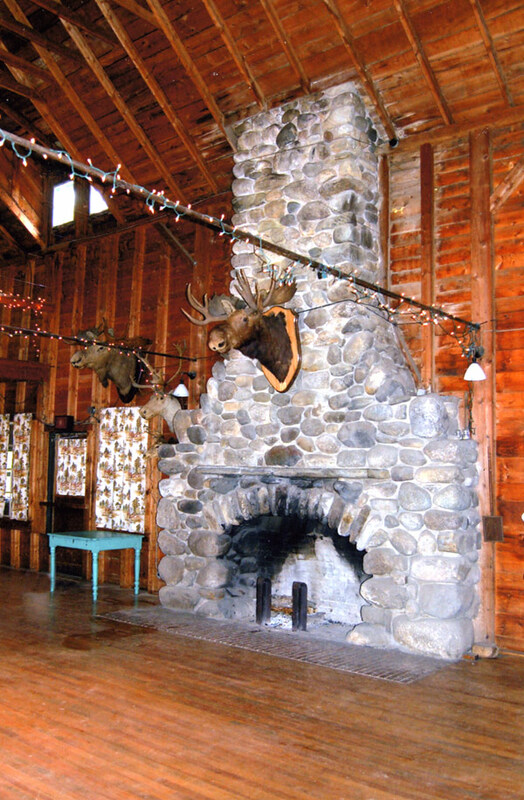 Decorations within the Lodge are allowed. You must not remove any of the posters, animal mounts, or any other interior furnishings. Set up the evening before is available for the nominal fee of $30/hour. Contact our Rental Chairman for details. 5. It is your responsibility to clean the Lodge area, inside and out, after your rental. In most cases we have another rental the following day, so the cleanup must be done the day of your rental. Please check with the caretaker before you leave. 6. All trash needs to be taken out to the dumpster. 7. All food must be cooked and consumed at the Lodge area only. The tables and grills at the beach are for Lodge members only. 8. There is to be no smoking in or around the Lodge area. You may, however, set up smoking in a safe area. 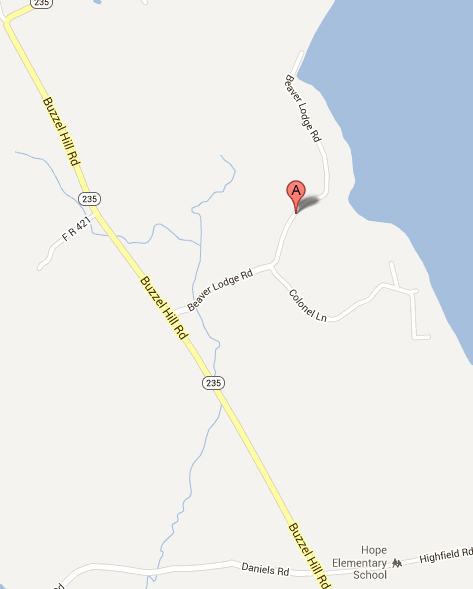 As you can see from the map to the left, Beaver Lodge Road is off of Route 235. What the map doesn't show you is that Route 235 is off Route 17. It's a couple of miles from Route 17 to Beaver Lodge Road. The "A" marker is actually the location of our range at 66 Beaver Lodge Road. The lodge is well beyond that, around the corner, and just about where the word "Lodge" appears. 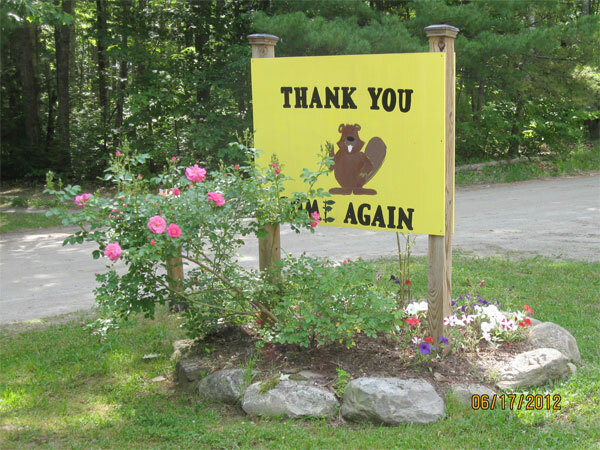 The "B" in Beaver is at the parking area for the swimming area and boat launching ramp. The 3D archery range is there as well, in the woods back from the lake.